The DALSTRONG Chef Knife is ideal for those who prefer the look and feel of a classic, European style chefs knife. The blade is deeper than average, designed to execute heavy duty chopping motions with ease. Although this is the most expensive budget chefs knife in our guide, a quick look is all that’s required to see why it’s well worth the cost. At first glance, you can see the craftsmanship of this blade. The high-carbon German steel, polished to a satin finish, is quite beautiful. The edge is sharpened to 18 degrees by hand and tempered to resist rust and corrosion. The metal scores an 55 Rockwell hardness, meaning the edge will hold its sharpness well. As with most quality chef knives, DALSTRONG uses a full tang to help create a comfortable and secure grip. The handle is made from laminated Pakkawood which is good for a few reasons. For one, it’s non-slip, so this blade is easy to hold onto and won’t move around in your hand. Two, this material is impervious to the oils, salts, and liquids found in commercial kitchens, making this a knife suitable for professional or hobbyist chefs. The presentation of the knife also matches it’s higher price tag. It comes in a well-made box, with a sleek black sheath. For holidays, this knife, combined with a nice gift wrap, makes an elegant and useful gift for anyone who likes to cook. Unboxing review of the Dalstrong Gladiator 8″ chefs knife. You will be amazed at how sharp this knife is when it comes out of the box! The deep blade offers a few benefits like increased knuckle clearance as well as making chopping much more efficient. The added depth is great for the rocking motion style of cutting, which is used to make slicing, dicing, and chopping more efficient during food prep. DALSTRONG includes a BPA-free, protective sheath with every order. The sheath itself is a matte black colour that looks sleek and is made from a thick plastic that fits the blade snugly. The handle is not only comfortable to grip, but it’s constructed to stand up to a lot of heavy workload. The handle’s material won’t degrade or wear down over time, and it feels secure in hand with three rivets and a full tang. It also has a front bolster with a finger guard and a rear bolster behind the handle. It is the most expensive knife in our guide, as the price tag creeps into the range of the higher end knives. Some chefs may find the handle to be cumbersome or heavy. The rear bolster added to help balance the blade ads noticeable weight. 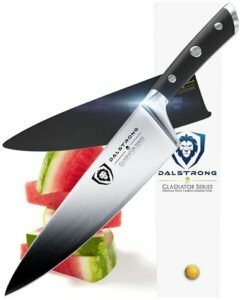 DALSTRONG Chef Knife – Gladiator Series – This knife stands out with the hand polished, hand sharpened German steel blade that looks and performs very well. It has a very solid handle with a full tang, built to last with Pakkawood. It is a knife perfect for busy commercial kitchens as well as home cooks. DALSTRONG Chef Knife – Gladiator Series – This budget chefs knife was the most expensive in our guide, but for justifiable reasons. The blade is made from the same high-quality steel you see in more expensive models. The durable plastic sheath included is a nice touch that isn’t included for most knives of this price range.